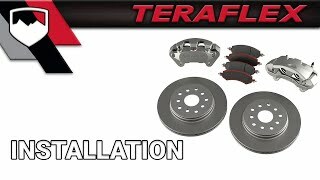 The TeraFlex JK/JKU Front Big Brake Kit is a must for JK Wrangler and JKU Wrangler Unlimited models requiring increased braking performance with oversized – and heavier – wheels and 33-35” tires. This simple bolt-on upgrade doesn’t require cutting, welding, or adapters. • Requires a minimum of 17” diameter wheels. • Front Big Brake Kit w/ standard brake rotors (# 4303400) also available. I put this big brake kit on my JKU and it stops my 40" Kevlar MTR's on a dime!!! Install is a breeze and materials are rock solid and built to last. My Jeep stops like a sports car now running on 35's. Install was like any other brake job. They are a huge improvement over stock. Beware, they say minimum of 17" wheel. That leaves barely any clearance between the wheel and caliper for wheel weights. I had my newly balanced wheels have their weights ripped off after install. I recommend these brakes with at least 18" wheels. 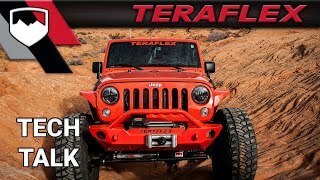 Found this kit after unending frustration with long stopping distances on my 2010 Jeep JK with 37 inch tires. While I did not do the install personally, my friends Darren and Travis said it was a smooth install. I would also recommend the big bore master cylinder for this year. Also replaced rear rotors with the big (non-slotted) rotors and used the factory brakes. The difference is well worth every penny and I can drive with confidence Very positive stopping power!